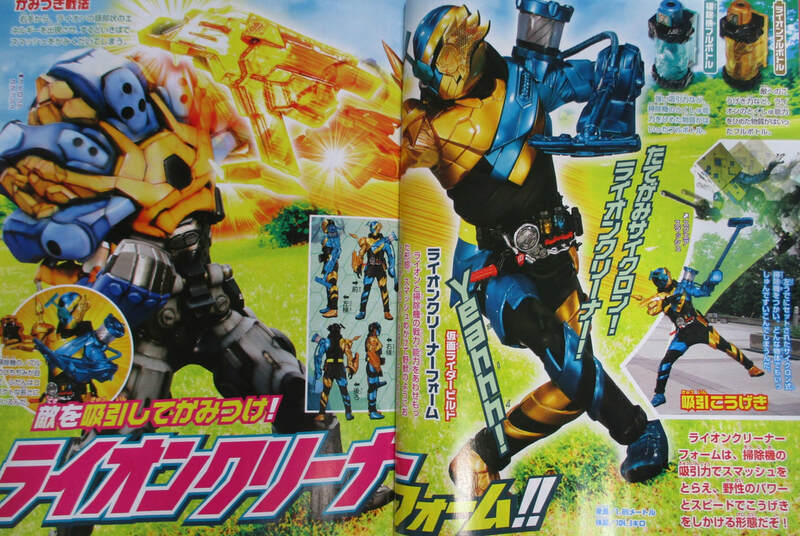 Kamen Rider Build - 4 New Best Match Forms To Debut This October! Looks like the month of October will be a Best Match parade! Yes, 4 new Best Match forms will be debuting at the start of the ber months as revealed in this newest Terebi-Kun magazine scans! First image is the Best Match form that will debut this coming Sunday, the NinninComic form a.k.a. the Ninja Entertainer! This match uses the element of the Ninja and Comic Full Bottles and is armed with a Ninputou. Next is the RocketPanda form, the Jumping Monotone! This form uses the elements of the Panda and Rocket Full Bottles and just like the HawkGatling, this form can also flow and is guided by his left hand that is shaped like a rocket! Uchuuu Kitaaa! And then there's the FireHedgehog form which uses the Fire Rescuer and Hedgehog Full Bottles. 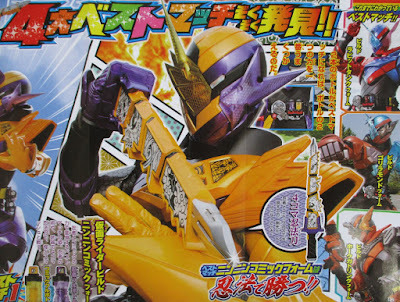 His left hand has a nozzle that can blast water or fire while the right hand, the Spike Rush Arm, is used for power punching attacks! Finally, we have the LionCleaner, the Mane Cyclone! This form uses the elements of the Lion and Cleaner Full Bottles. The Lion Arm is used for bitting attacks and the finisher is called Coltech Finish LionCleaner version. Can someone explain to me what is it about each new combination that makes it seem like a good idea? Like why do a Lion and a Vacuum go well together? To Annonymous's questions, Lion and Vacuum go well together because both involve cleaning. Vacuum, self-explanatory while Lions are known to groom their young. @2nd Anon: I think I can help with that... Lion and Soujiki go together because they are both to do with cleaning, more so for the lion itself known for grooming its young. For FireHedgehog and RocketPanda, it's do with protection and altitude travel respectively. I think someone on TVtropes made a list on the Fridge Logic page for Kamen Rider Build. ...is it just me, or is LionCleaner fighting another Strong Smash? Is it possible that Faust gets the Gorilla FullBottle, or just has more of that Element? Or...perhaps there's more than one Element that makes a specific SMASH? 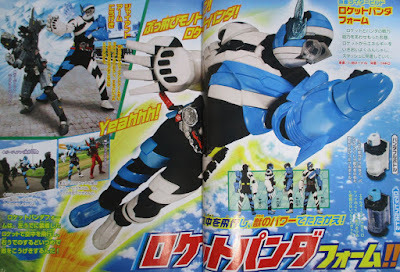 Seeing Build fighting anoter Strong Smash doesn't confirm anything really, remember one of Hyper Muteki's scan has him fighting Lovelica eventhough Lovelica never came back. 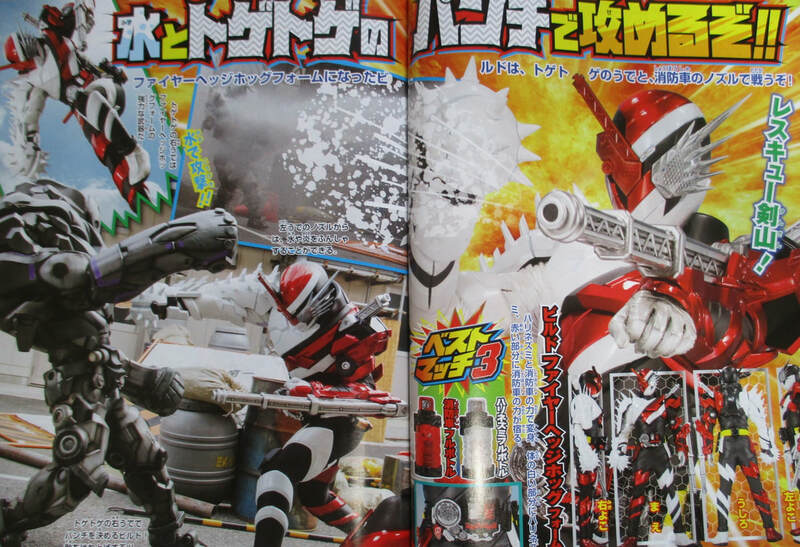 But, knowing Toei maybe Build will go Drive's route, recycling monster suit for another monster 20 episodes later. So everybody agrees that NinninComic is the BEST (pun intended) looking form, right? Yeah, see the problem here? The 'old days' you are talking about NEVER technically existed. In Showa the Riders only had 1 form, there was no real secondary Rider and the stories where all basically problems of the week. Heisei has either a lot of forms or a lot of Riders with a story that normally connects week to week with an ongoing plot. This is a merchandise-driven show, what do you expect?